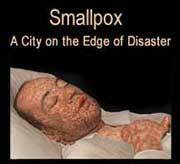 In the early years of the 20th century, the city of Cleveland experienced a major outbreak of smallpox. This epidemic brought the city to the edge of disaster in 1902. Only a program of community-wide vaccination halted the spread of this dreaded infectious disease. This was not easy to achieve, and came about only through the effective cooperation of Cleveland’s elected officials, public health officers, the medical community, civic-minded businessmen, religious leaders, and educators. Thanks to their efforts, this would be the last smallpox epidemic in the city of Cleveland. We can trace the course of the epidemic and the city’s response through newspapers, city council archives, medical journals, and public health reports. These sources chronicle the sequence of events and identify the major “players,” but do not adequately relate the horror that smallpox evoked in the minds of Clevelanders. A unique documentation of the epidemic does survive, however, in a remarkable collection of photographs. Homer J. Hartzell, a young physician caring for smallpox patients at the city’s “pest house,” captured the epidemic on film. While he may have done so out of scientific interest, these photos speak to us across time, conveying the suffering and disfigurement brought by this terrible disease. This exhibit tells the tale of the epidemic, and shares these images publicly for the first time. Further photographic documentation survives in the Corlett Collection. Dr. William T. Corlett was professor of dermatology and syphilology at Cleveland’s Western Reserve University School of Medicine, he documented his work with photography throughout his career. Smallpox was unique amongst dreaded infectious diseases: it could be prevented by either inoculation or vaccination. Inoculation, dating from the 18th century, consisted of introducing an infected smallpox scab under the skin. The recipient, if fortunate, developed a mild case of smallpox and would thereafter be immune to the disease. If unfortunate, the recipient soon fell ill with smallpox in full force. This could mean disfigurement and even death, and there was no way to know which to expect. Inoculation therefore entailed serious risk. Vaccination replaced inoculation around 1800, following its discovery by Edward Jenner, an English doctor. Jenner observed that milkmaids, often contracted cowpox and, having had this mild disease, seemed resistant to smallpox. He therefore deliberately “vaccinated” people by injecting them with cowpox virus, in order to impart immunity to smallpox. By 1853 vaccination became compulsory in Great Britain, but for a variety of reasons the United States lagged behind. Smallpox was a frequent visitor to the cities of the world, and Cleveland was no exception. Minor outbreaks threatened the city in 1833, 1845, 1863, 1873, and 1895, but did not become full scale epidemics. Outspoken Cleveland physicians and health public officials insisted upon the importance of vaccination whenever smallpox appeared in the city, recommending that it be made mandatory. They also advocated quarantining victims of the disease and disinfecting their belongings and homes. Toward the end of the 19th century, however, Cleveland’s public health officials abandoned vaccination in favor of the isolation of smallpox patients and disinfection of their belongings and homes. Health officials were not without reasons for pushing vaccination aside. Available vaccine often proved hazardous owing to impurity. It caused illness and in some cases, even death. Additionally, the site of vaccination could become infected with bacteria. Citizens therefore feared the vaccine, and resisted the vaccination programs. 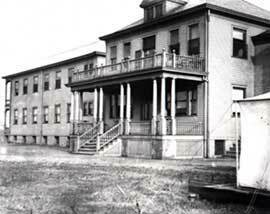 Consequently, when an outbreak of smallpox occurred in 1898, Cleveland’s City Health Officer Dr. John L. Hess emphasized disinfection and fumigation, in conjunction with detention and quarantine — not vaccination. However, this approach to arresting smallpox proved increasingly ineffectual over the next four years. The number of smallpox cases increased steadily and by Spring 1901 the disease reached epidemic proportions. City officials had a looming health catastrophe on their hands. Martin Friedrich, Cleveland’s newly appointed chief health officer, to activate a large scale vaccination program. Soon after this commenced, however, four persons died and several more became ill, all apparently victims of bad vaccine. Resistance to vaccination increased, compelling Friedrich to once again abandon it in favor of isolation and disinfection. He expanded isolation and enforced it more strictly, and he initiated the widest disinfection program the city had yet seen. Disinfecting crews, including many students from the city’s three medical schools (Western Reserve University, the College of Physicians and Surgeons – later incorporated into Western Reserve, and a Homeopathic Medical College) went from house to house with heavy sprayers, dousing everything in the victim’s home and neighborhood with formaldehyde. Meanwhile, the city hastily erected a new smallpox hospital on the grounds of the City Hospital (now MetroHealth Medical Center). By the end of 1901, the number of cases of smallpox declined significantly. Public health officials believed that disinfecting residences and isolating smallpox patients had been effective in halting the spread of the disease. In early 1902 the people of Cleveland enjoyed the return of normalcy, but their sense of security was unfounded. In fact, the city had been extremely fortunate: the preceding epidemic consisted of a relatively mild, less contagious variety of smallpox (variola minor). While isolating patients and disinfecting their homes had undoubtedly helped in its containment, these measures alone could not halt a more virulent strain of smallpox (variola major). Luck had been on the side of Clevelanders. Smallpox reappeared in May 1902, brought by an infected homeless person newly-arrived from Hoboken, New Jersey. To make matters still worse, the city now faced a lethal hemorrhagic variant of smallpox. With a largely unvaccinated population, Cleveland was particularly vulnerable to this more virulent strain. Thirty people died in a short time, prompting a vigorous municipal response. The city immediately ordered the erection of a barbed wire fence around the 1901 smallpox hospital to prevent patients from leaving.The photograph left depicts a sample tent installed near the entrance of the smallpox hospital, 1902, from Hartzell photo album. With full understanding of what was happening, the city’s health officer, Martin Friedrich, desperately attempted to implement a vaccination program. He had a new weapon at his disposal: a new bacteriological laboratory, opened at the end of 1901. Laboratory staff tested smallpox vaccine from various suppliers, until they found one that was both effective and SAFE. With this in hand, Friedrich sent dozens of physicians and their assistants to vaccinate people throughout the community. However, they met widespread resistance, particularly because of the difficulties encountered in 1901, and Friedrich feared that the vaccination campaign would fail. At this juncture, several groups came to the rescue. Physicians from the newly-formed Academy of Medicine of Cleveland (including Friedrich) led a renewed, reinvigorated campaign for vaccination in 1902. By the Fall, their campaign had vaccinated over 100,000 people, more than half the city’s population. Additionally, the campaign culminated in the compulsory vaccination of school children. After 1902, the Cleveland Board of Education would not admit any child who had not been vaccinated beforehand. The Cleveland Chamber of Commerce also rallied around the vaccination campaign, uniting businessmen, religious leader, and various civic groups. Contributing to the campaign’s ultimate success was the Mayor’s support, mounting public anxiety in the face of a looming epidemic, and Friedrich’s assurances that the vaccine employed was now safe and effective. As more and more Clevelanders received the vaccine, the specter of the epidemic receded; by early 1903, it was all but over. Cleveland had come dangerously close to catastrophe, but physicians, public health officials, civic leaders, and educators worked together in a spirit of civic unity and averted the calamity. 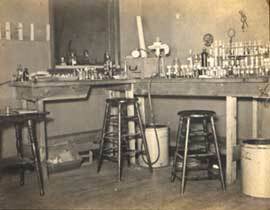 Photograph right the bacteriological laboratory, at the Smallpox hospital 1901-2, from the Hartzell photo album. This exhibit was written by Patsy Gerstner, PhD.